Smart Positioning and Incremental CPC – New Google Beta. Very Confusing and Potentially Revealing? By David Rodnitzky on 01/22/2009 in "Analytics Blogs"
It’s designed to get you more clicks for the same total cost. When I hear “more clicks for the same cost” that immediately makes me think of “portfolio management bidding”, made famous by Efficient Frontier. The concept of “cost-effective position” sounds suspicious to me, simply because cost-effectiveness cannot truly be measured without considering both price and conversion rate. And “reducing the frequency of bid adjustments” I guess is a good thing, but again, only if this is based on some sort of ROI determination, which in this case it is not. Does this make sense to you? Someone paying $.47 in position #2 would have to pay $.75 to show up in position #1, even though the person currently there is only paying $.50? I don’t get it. Somehow, however, this is supposed to be a benefit to advertisers, as shown in a series of examples that demonstrate how your CPC can decrease as a result of enabling Smart Positioning. I just don’t get these examples, for two reasons. First, shouldn’t the bidder with the highest CPM (and Quality Score, but these examples assume that QS is equal for all advertisers), always show up #1. If two advertisers have the same CTR but one advertiser has a higher Max CPC than the other advertiser, shouldn’t that advertiser always win? How is this system any different? So either this example is just a poorly written one, or this is an admission by Google (perhaps inadvertently) that the efficiency of the auction is not quite what advertisers have been told that it is (to Google’s benefit). In any event, I’m hoping some people smarter than me can read about this beta and understand it – I am totally perplexed and keeping my clients away from it until I know what I am doing! 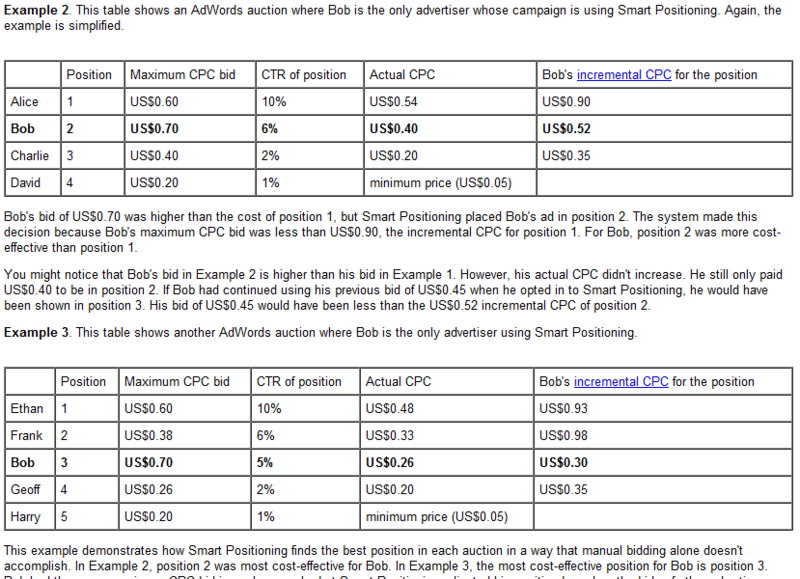 2 Responses to Smart Positioning and Incremental CPC – New Google Beta. Very Confusing and Potentially Revealing? I’m probably starting to sound like a broken record but….without factoring in conversion data, how can Google possibly determine whats best for the advertiser? Yeah, but its a record worth playing over and over again!